Hartpury were unable to break their losing streak at Coventry on Saturday, although they did pick up what might turn out to be an important bonus point. Report from Hartpury student, Jenny Bates, photo from Hartpury student, Lauren Couchman. After a tight first half, in which there was little to warm the hearts of the more than 2000 crowd on a chilly, gusty day, this game offered more entertainment after the interval. Hartpury eventually gained the consolation of a losing bonus point, but not the elusive win that would have gone some way to easing fears that the Red & Blacks might experience relegation for the first time ever in their history. There was plenty for visiting supporters to be positive about in the pre-match news. Significant contributions by both Gloucester Rugby and Bristol Bears meant that, on paper, the squad was as strong as it had been all season. Alex Craig and Lloyd Evans were both starters from the Cherry & Whites, while scrum half Charlie Chapman had a slot on the bench. 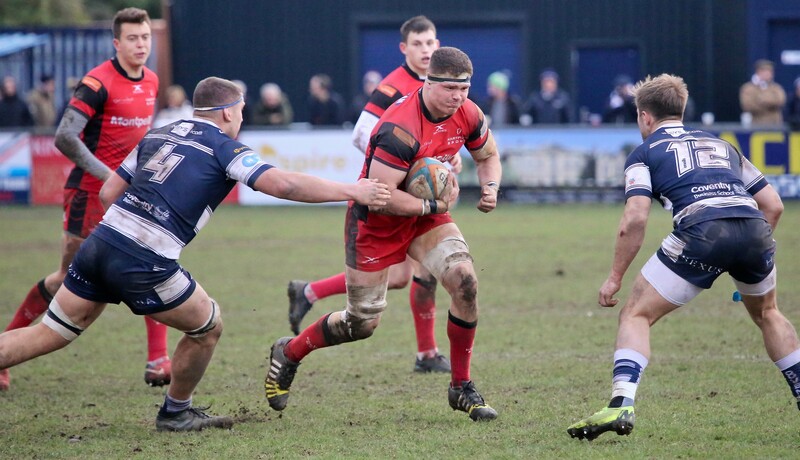 From Ashton Gate, Hartpury had the services of mercurial former student Mat Protheroe to increase their attacking options. He was joined in the squad by four other members of the Bears Academy. Coventry started the game playing with the support of the swirling wind and were on the scoreboard by the 12th minute with a converted try. A fluid counter attack through the Bulumakau brothers – Andrew and Junior, the former an ex-Hartpury student – and a neat pass from Heath Stevens allowed Rob Knox to touch down in the corner. Will Maisey added the extras. It was taking some time for Hartpury to get going as an attacking force and it was not until beyond the half hour mark that they posed any significant threat. A half-break from Ben Foley brought the visitors into Coventry territory and Hartpury were slowly driving the ball towards the posts. The home team were penalised for not rolling away and Lloyd Evans secured the three points by slotting the kick between the posts. There were no further scoring opportunities and Coventry had a 7-3 lead going into half time. Hartpury looked more assertive after the restart and they took the lead in the 53rd minute. A penalty was sent deep into the home 22 and the forwards were narrowly denied a score from a lineout drive. However, the resulting scrum eventually led to Hartpury’s man of the match, Bears’ back row man, Sam Graham, claiming the try. Evans added the extras to make it 7-10. The lead was short-lived, however, as four minutes later they were all square after a penalty kick from Will Maisey, which came after Hartpury had been pressing for a further score. With 10 minutes remaining, Hartpury gave up a penalty, which was kicked to the corner, before Scott Russell was bundled across the line by his team mates and Maisey’s conversion had Coventry back to a seven point advantage. The hosts had momentum now and worked the ball through several phases until Junior Bulumakau found the opportunity to score in the corner. Again, Maisey converted and it seemed that Hartpury might leave empty-handed. However, the visitors fought hard into injury time and again it was the forwards who produced the goods, Alex Craig eventually applying the finishing touch after a series of drives. Evans’ conversion ensured that Hartpury left with the point and, in fact, narrowed the gap on fellow-strugglers Richmond who picked up nothing from their home game with the Cornish Pirates. All is certainly not lost for Hartpury, but they will know that nothing less than a win, preferably with the bonus point, will be enough when they host Richmond at the Gillman’s Ground next Friday night (7.45pm). Coventry: Halaifonua; J Bulumakau (Try, 77), Knox (Try, 12), Stevens, A Bulumakau, Maisey (Con, 13, 71, Pen, 58) , Kessell; Gibbons, Tolmie, Boulton; Russell (Try, 70) , Oram; Faleafa, Nutley, Adams. Reps: Jubb, Lewis, White, Makaafi, Beech, Brighouse, Nilsen. Hartpury: Protheroe; Henry, Powell, Forrester, Foley; Evans (Pen, 34, Con 65, 80), Cochrane; Murphy, Tanner, Armstrong; Craig (Try 80) , Quinn, Graham (Try,53) , Qera, Grieve. Reps: Chapman, Leeming, Edevbalo-Ehidze, Gilbert, Morris, Merrey, Stratford.